Roofing systems are usually divided into a category of either a Low Slope or a Steep Slope roof system. Low slope roofing systems are designed to be water impermeable where steep slope systems (over 3:12) are often designed to be water shedding systems. 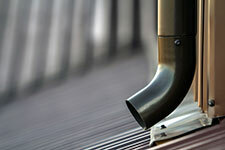 Single-ply membranes are factory-manufactured as either thermoplastic or thermoset sheets. 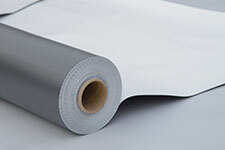 Thermoplastic membranes are usually seamed together using hot air welding and Thermoset membranes are typically seamed together with glues or tapes. They are known by their chemical makeup abbreviations, i.e. TPO, PVC, KEE, CPA, EPDM, etc. Single ply membranes are installed by mechanically fastening, adhering with adhesives, ballasting, or a combination of these. We are proficient in installing all types of single ply membranes and are able to offer full manufacturer warranties up to 30 years. Built-up-roof (BUR) systems and modifed roof systems have a 100 year track record and are often known as “tar and gravel” and "modified" roofs. These roofs are installed with multiple layers of fiberglass felt in either hot asphalt or a petroleum based cold adhesive. The surface is usually composed of either gravel in hot asphalt or granulated cap sheet. 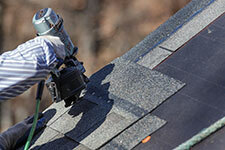 Our team has been installing BUR/Modified roofs for over 30 years. While other companies have gone away from installing these roof systems, we believe BUR systems have a definite place in the market and we have all the equipment and talent to properly install these systems. Asphalt shingles are made using a reinforced asphalt base layer with colored granules installed on top to provide fire and UV protection and also provides the options for numerous architectural styles. Shingles are installed over ice and water shield and felt underlayments. There are three general types of metal roofing used in steep-slope roofing that include: architectural metal panel, structural metal panel and metal shingle/shingle panels. Most metal roof systems are designed to shed water rapidly. Metal roof systems come in various thicknesses of metal and quality. We recommend using commercial grade metal roof systems when choosing a metal roof. In addition, architectural grade metal can be installed to provide high-end design options for a building or home.